My Cable Mart introduces our next-generation of solderless connectors, the new, patent pending MaxBlox EZ Termination System. This innovative, rugged all new design allow installers to terminate an HD15 with just a screwdriver, and mount it in a panel, plate, or MaxBlox hood in a fraction of the time it would take to solder, saving both time and money. This specific block connector is used to REPLACE or REPAIR an existing MALE VGA connector. When used in conjunction with the MaxBlox hood (included with this kit), these connectors simply slide, snap and lock into the hood without the use of tools. 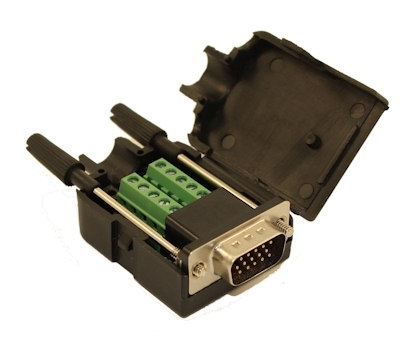 Optimized for use in any A/V application where VGA controls are used, the HD15 connectors are manufactured by with genuine Phoenix Contact terminal blocks, the industry standard for reliability. 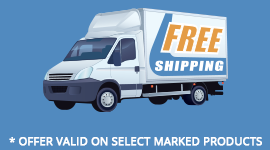 The system accommodates wire diameters, from .120 inch. to .500 inch. Tech Note: Some familiarity of wiring and the use of blox connectors recommended for this product. Many VGA raw material cables do NOT use standard wiring coloring - and may require either a ohms-meter to test connectivity of your wire. As only 10 wires are terminated using this block, EDID (Extended Display Identification Data) information commonly used for "Plug and Play" capabilities is not available. The use of a continuity tester (aka volt-meter) to identify the correct pin-outs of your VGA connector and to verify your continuity is recommended. Please click PDF MANUAL for additional pin-out and connection information. Tech support for this product can not be provided. Remaining 5 connectors are GROUNDS for each of the above. Please see http://en.wikipedia.org/wiki/Extended_display_identification_data for more information about EDID.